Here I am with one last look from my journey to NYFW and let me tell you that it was a very special look for me. I had the pleasure to connect with a creative designer/ artist and his team: Lie Sang Bong, and to be dressed with some creative pieces from a previous collection for his show. More photos from his showroom, behind the scenes and also from the show will follow in the next post. As you can see I chose to wear a neoprene printed coat in white/ royal blue color, neoprene pants and a beautiful top with flower prints. 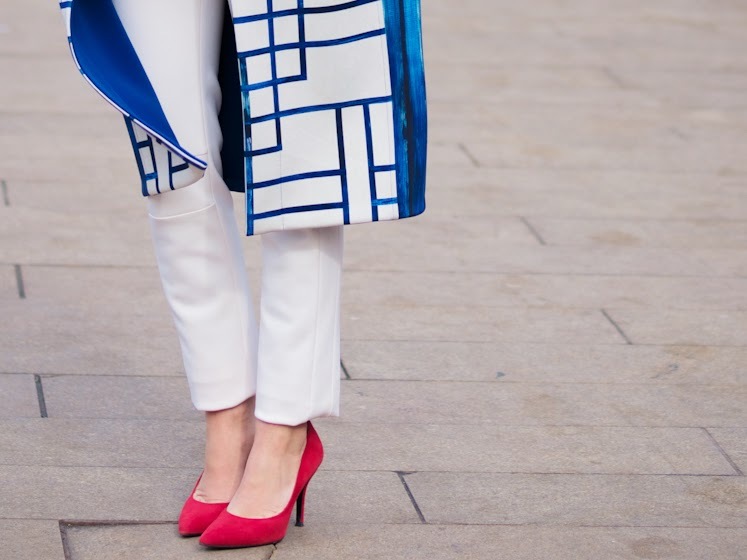 To complete the look in the same bold matter I added a pair of red pumps, minimalist baby blue bag and red lips. 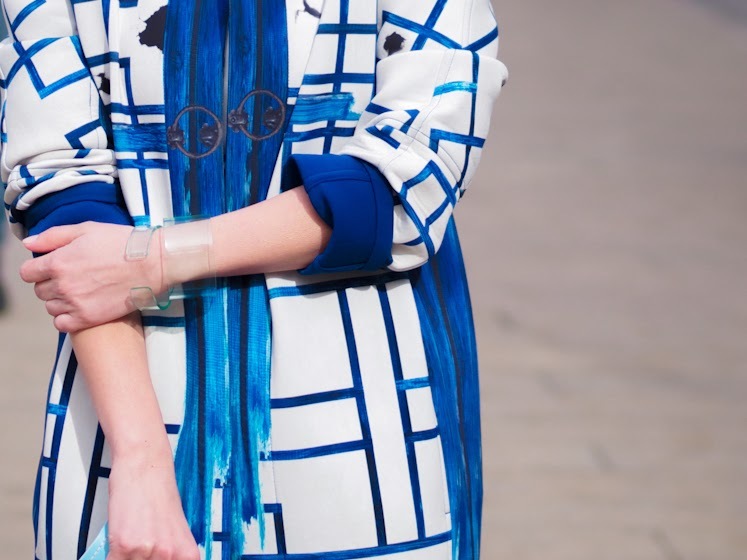 I find this outfit very me, artistic, but in the same time minimalist and very easy to wear. Definitely Lie Sang Bong is a designer to watch and can't wait to see his journey here in USA. amazing coat ! <3 love the outfit ! Such a futuristic/ edgy outfit! I love the coat! What an amazing piece! 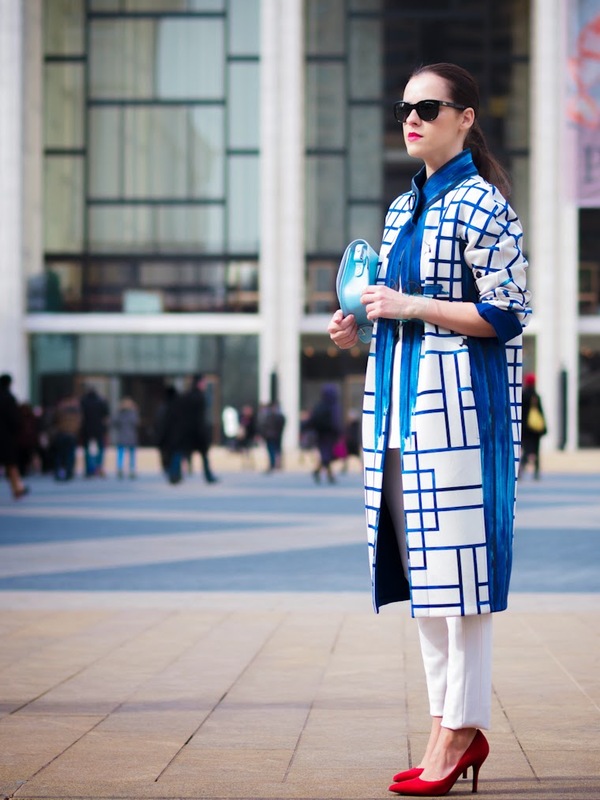 The coat reminds me of ancient Asian buildings. However, the blue added a modern touch! And I love how you paired it with clean white and shades of red! Wow, that is a one gorgeous coat!!! Love it. Absolutely gorgeous!!! I love everything about this look: the patterns, the prints, the colors…EVERYTHING! Such a fun look! Obsessed with that coat! This coat is truly a piece of art. How utterly beautiful!